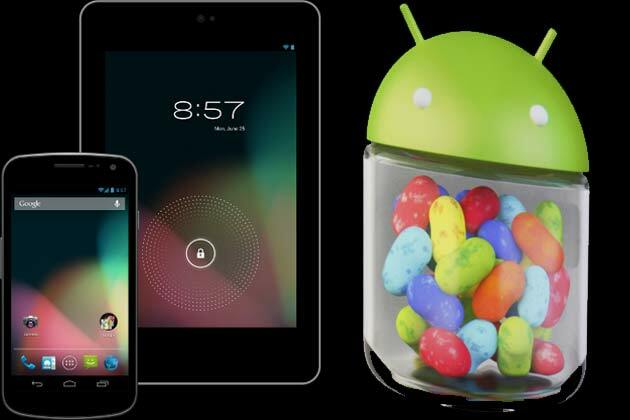 The new iteration of Android OS has been announced at the annual Google Conference today, with the Android 4.1 Jelly Bean bringing forth a whole new set of features to make Android experience even better. . While Android 4.0 being a major upgrade from Gingerbread 2.3 with a completely new interface and speed improvements, according to Google Jelly Bean improves on that through a feature called the “project butter”. This will help the OS as much as 100x faster and smoother, which allows it to run on 60 FPS. The customization has also been substantially improved, with widgets wrapping themselves around the available space, removing the need for going through the process of moving on widgets and icons. This will help Android become a better platform; given the OS from Google have been lagging in speed from their competitors like iOS and Windows Phone 8. While the Android Ice cream Sandwich lets you access the notifications from the lock screen and allowing access for an app through them, 4.1 JB takes it a step further allowing the action to be taken without even accessing the application and everything can be done from the notification window pane. From missed calls to messages, you can directly reply from the notification window pane itself along with features for making and ending calls from the notification pane as well. Also the Social networking and third party app integration has been improved, with a user being able to see Google+ photo from the lock screen itself without having to go to the app. making comments is also possible through a notification from the window. Some of the popular third party apps can be displayed just by swiping the notification. Project Majel, the substitute for Siri , has been integrated in the new Jelly Bean update. The Google Now directs you to a different route if you are on one which has a lot of traffic ahead. It will direct you to attend the meetings on your calendar and can give you details on your flight bookings and schedule. It is much better than Siri when it comes to Business usage and allows for tasks to be completed quickly and easily. Not only the keyboard has been improved, the JB 4.1 also includes online voice dictation. As a result one doesn’t need a network connection for using a voice dictation unlike Siri . It is presently available only in English US but it will soon be available in other languages as well. An awesome feature in the form of instant shutter has been added to the camera. Swipe can be used for viewing the currently clicked photos and deletion of photos. Swiping up is helpful for deletion of photos, while swiping side to side will enable you to review the photos that you have taken. Whether it will beat its competitor in terms of speed and processing will have to be seen, but the new OS definitely boasts of some amazing features.